Next up we’ve got another Scent of the Month from Al’s Shaving Products. The sweet citrus blend of the orange orange and the petitgrain are most immediately perceptible in this scent, supported by the base of the woodsy scents; the ylang ylang softening up the scent a bit. I do rather like it; I was pondering between a 8 or a 9, but as the girlfriend also appears to have quite enjoyed it, a 9 it is. The strength could have been a bit better, although I know that’s sometimes hard to do with citrus aromas. It came on at what I’d say is about medium/strong strength, and only faded a bit from there. As for the lather; despite the fact that the fragrance changes can apparently have a slight difference in performance, overall it’s the same great product. Great balance of glide and thickness, being a bit on the thirsty side to get there. Good moisturization, and good lather stability. Anyhow, I’ll be giving this a 8/10 overall. Cost: This sample was provided gratis for the purposes of this review. A 4 oz tub will set you back $20. Bikini Bottom is our new light and refreshing aquatic scent. Notes of kelp that give Bikini Bottom a subtle delicate floral and citrus character that some people associate with honeysuckle. Notes of petitgrain with touches of bergamot, sandalwood and ozone add to its complexity. Bikini Bottom has a unique aroma and incredible performance. Nope, looks like I just misinterpreted something he mentioned. Please ignore. He mentioned that he adjusted the formula to give it a bit more in the way of moisturization; I didn’t really notice much in the way of difference, with either the moisturization or the lather, except for perhaps it needing a bit more elbow grease to lather up all nice like. Or perhaps I was just imagining it; it’s sometimes hard to tell, and it was still at the very least quite close. Either way, it’s still a top notch lather. One of the few actual complaints I have about Al’s products is that he doesn’t give the full ingredient listing, so it’s hard to tell if you think he’s been tweaking things. Anyways, I can’t really say that I was too much of a fan of the scent, but I’m not really a fan of the aquatic scents overall. I’m sure there’s a lot of you out there that’ll like it more than I. Strength wise is was quite good; comes on very strong, fading to what I’d say was a middle-strong level by the time I finished one of the passes. Anyhow, I think I’ll round this one to an 8/10. If you do like the aquatic fragrances, I’d highly recommend it. Ingredients: “The forumula of Al’s Shaving Cream is Triethanolamine and preservative (parabens) free and only contains sodium and potassium salts of fatty acids (stearic, oleic, linoleic, palmitic, myristic and lauric) in addition to water, glycerin and botanicals.” With the caveat that the ozone scent isn’t from an essential oil (as no such thing exists). Heya folks. Long time no see; sorry I’ve been a bit busy lately, haven’t gotten around to writing up any reviews. 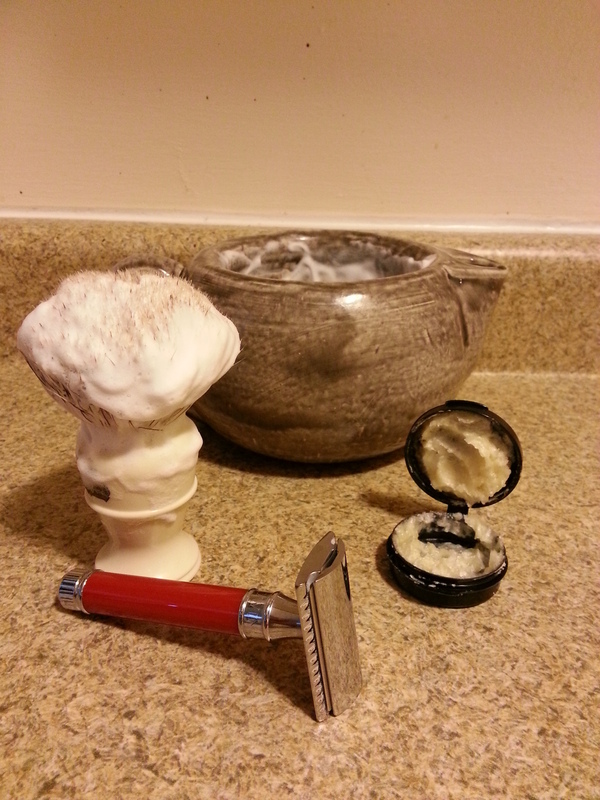 But the next on our plate is a cream from one of my favorite artisans; one of Al’s Shaving Products scents of the month: Al’s Spice (pun intended methinks). Al’s Spice character is inspired by the Caribbean. Al’s Spice opens with notes of lemon and geranium and coriander. Cardamon, pepper and nutmeg follow in a rampant parade of exuberance. Clove, cinnamon and allspice support the incredible presence of this powerful yet classy offering. Al’s Spice’s scent is reminiscent of your last trip to Grenada (Island of Spice) very spicy with a bracing and invigorating character and a clean refreshing finish. All in all, that seems mostly accurate, although I will say that the spice aspects of the scent predominate to my nose, with only a faint bit of the citrus and the floral aspects. Overall, I quite liked it. As did the girlfriend, which helps since we’re often in disagreement there! 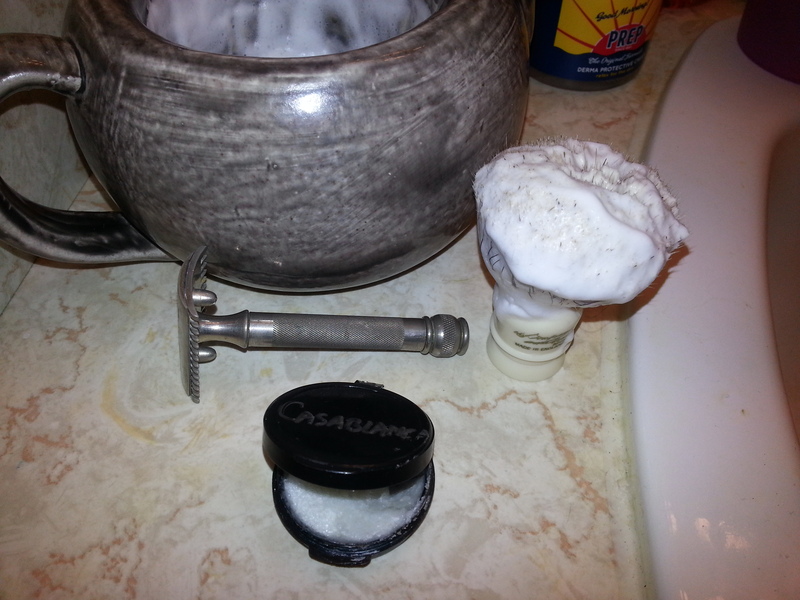 The strength was also pretty good; it had great staying power, staying at a medium-strong level throughout your shave. I would have liked just a tiny bit more oomph to it. It’s not strongly scented, but not weak either. 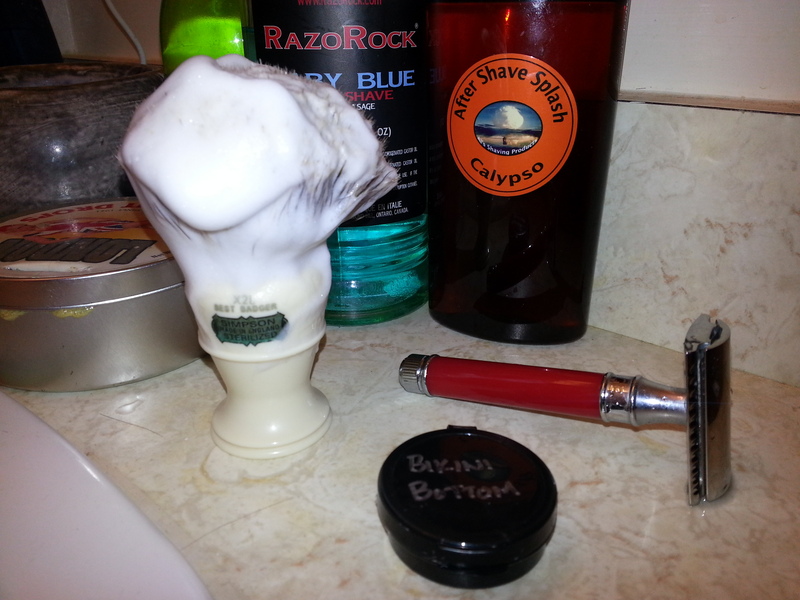 Once applied, it does manages to last the shave without much in the way of fading. The lather was the usual from Al: top notch. A thirsty cream, you’ll want to make sure you’re using enough water. Don’t overdo it on the amount of cream you use, with enough water you’ll get a lot of volume out of just a little bit of cream. Otherwise it’s hard to mess up, with a wide sweet spot for a good balance of glide and thickness, and some nice moisturization to the face as well. Overall I’ll say this merits a strong 8/10. Cost: This sample was provided gratis for the purposes of this review. A 4 oz tub is available for $20. Al’s Private Stock is a mix of strong floral notes of geranium and rose otto supported by West Indian sandalwood and cedarwood in the background. The florals are far more prevalent to my nose than the woody notes are. 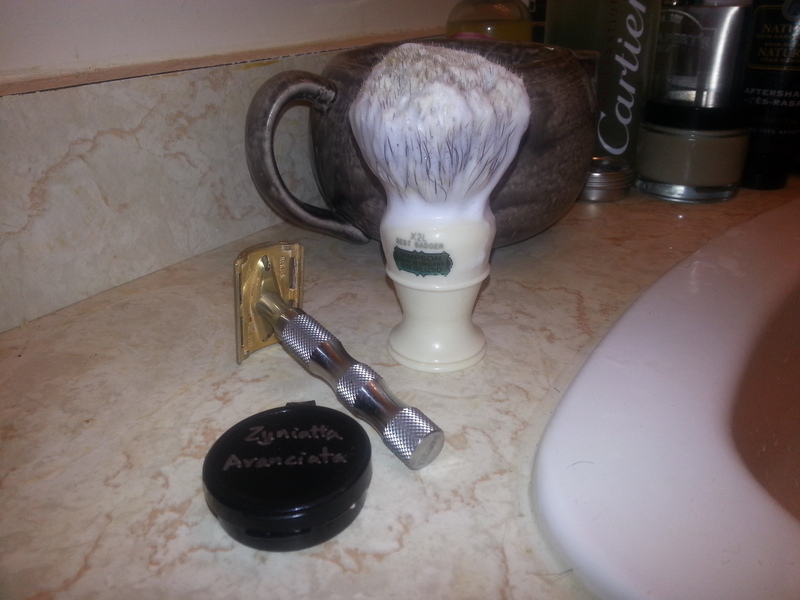 For those of you familiar with Al’s shaving creams, you should be aware of how his creams tend to smell very different when lathered versus unlathered; that’s not the case for the Sapone da Barba; what you sniff is what you get. All in all I thought it was fairly pleasant, and reasonably strong, without any fading that I noticed. 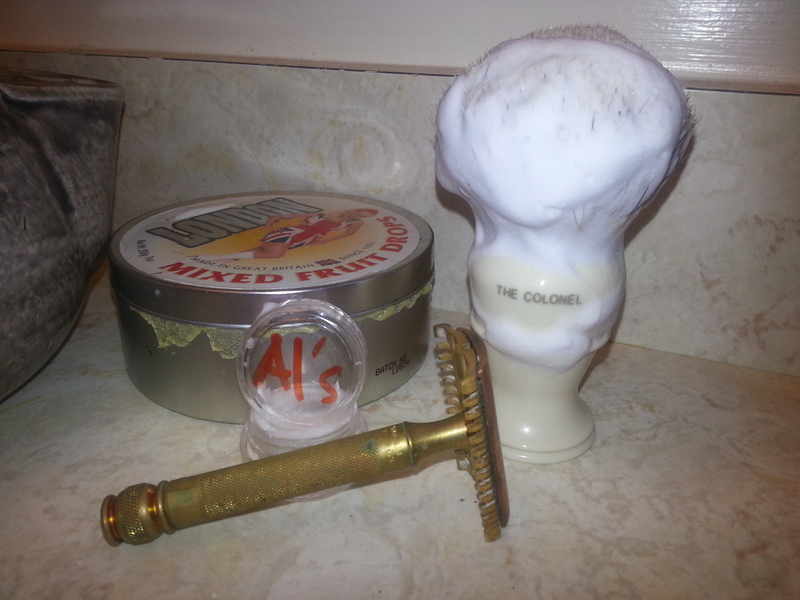 The lather is produces is damned good stuff, as I would expect for one of Al’s products. While overall I think I slightly prefer the performance of his creams, this did still produce a cream with a good balance of glide and thickness (ending up just a tad thinner than the cream when enough water is added to get the lubrication needed, from what I can tell), and some decent moisturization properties to boot. All in all, I’ll call this one a rather solid 8/10. 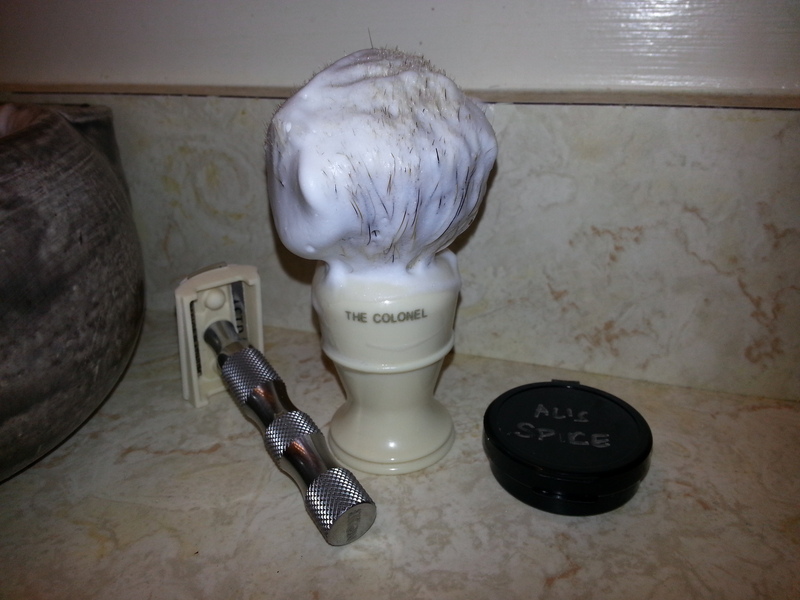 Cost: This sample was free from a kindly redditor (probably the same fellow who supplied the sample for this review over at The Close Shave) who wanted to see what I thought. To actually purchase some, it’ll run you $25 for a tin. The 2nd of the two Scents Of The Month from Al for April is Casablanca. It’s cedar scent with orange, conifers (well, other conifers, since cedar itself is a conifer too! ), and spices. It is an absolutely lovely masculine scent. While the cedar is most noticeable at first, the orange caught up within a few sniffs; together the two make quite a pairing, and the spiciness gives just a little bit of kick to back it all up. As for the shave itself, it’s the great shave I’ve come to accept from Al’s. Thirsty cream, so use a fair bit of water. It’s not easy to screw up, having a nice and wide sweet spot for acceptable water content, giving you a good balance of the amount of lubrication you get and the thickness of the cream for your cushioning. Good moisturizing properties as well, giving a nice soft feeling to the face. Cost: This sample was provided gratis for the purposes of this review. The SOTMs are available for $18 for a 4 oz tub. Al’s Shaving Products has three of their “Scents of the Month” coming out for April, and I was offered a chance to get a sneak peek at two of them. The first would be the Rosebud. 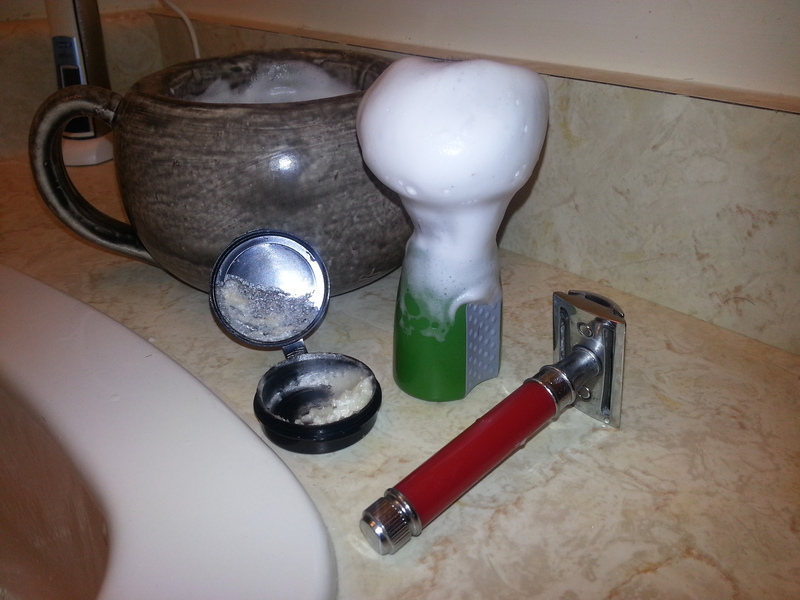 As per usual, Al’s Shaving Products provided a very nice shave. It’s a thirsty cream, so don’t skimp on the water; it’ll be put to good use, and you don’t need to worry much about overshooting the water content, as it’s got a pretty wide sweet spot. Nice and thick, while plenty slick, and leaving the face feeling more and soft and moisturized than most creams do. The aroma is a floral scent (rose and lavender), with a base of musk and hints of citrus and spice. The florals were tempered nicely by the other scents, avoiding becoming cloyingly sweet. Al says that he was shooting for “a cleaner version of Pierre cardin pour Monsieur [more] oriented for younger audiences, [that] dries with notes that are similar to Old Spice”, if that helps you make a decision on whether or not you’d like it. The strength is pretty decent. It comes on strongly, and stays that way throughout about half of a pass or so, after which it’ll start fading somewhat. By the end of each pass, it’s definitely still there, but not quite what I’d call strongly so. At the start of the shave, it’s at a 10/10, by the end, about a 8/10, IMHO. I’m happy enough to round this one up to a 9/10. If the scent sounds appealing, I suggest getting it while you can. Calypso can be described as cool, refreshing, bracing. There is also a warm, friendly, honest feel to this fragrance and one that is extremely natural. On top of this, there is also, strangely, a shadowy, deep, mysterious, spicy quality. The scent itself may be relatively simple but its impression is complex. The first thing that needs to be mentioned is that the scent of this shaving cream transforms when lathered. When in just the cream form, it has a subdued scent that comes across as a bit grassy, that smells (to steal a phrase from Douglas Adams) almost but not quite entirely unlike Bay Rum. But once you start lathering up, the aroma of the spices absolutely fills the room. The bay leaves, cloves, and cinnamon are quite evident, and if smells just great. And as you could guess from the description of the scent filling the room, there is no problems whatsoever with weakness of the aroma here. 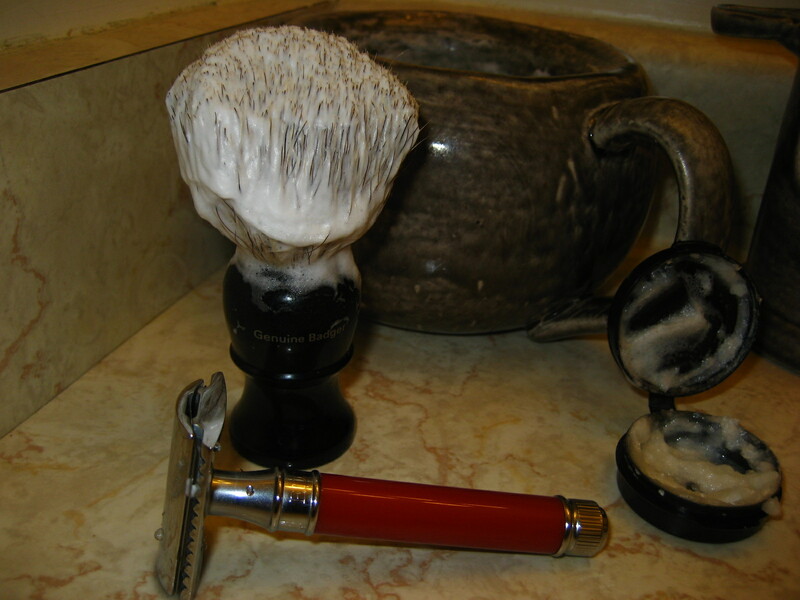 It remains strong once applied to the face, and doesn’t fade noticeably while shaving. The shave itself was likewise quite nice. It’s a thirsty cream, so be sure to not be stingy on the water. Once lathered up, it’s thick and slick (don’t worry, it puts all that water to work rather than just thinning out), and left my face feeling wonderful after a BBS shave both days. Definitely a 9/10. Seriously, go try it. Worth a sample for sure. The scent is something I quite like. The description of the strong citrus scents, with a bit of florals tossed in the mix certainly seems accurate, although I’m not entirely sure I agree that it’s all that reminiscent of old times gone by, or a classic barbershop. It’s a complex scent that seems rather modern to me, sweet and tart and fruity and flowery, while at the same time remaining rather masculine. Strength wise, it was just about spot on, the scent filling the bathroom from the moment you lathered up, without fading all that much while you shaved. 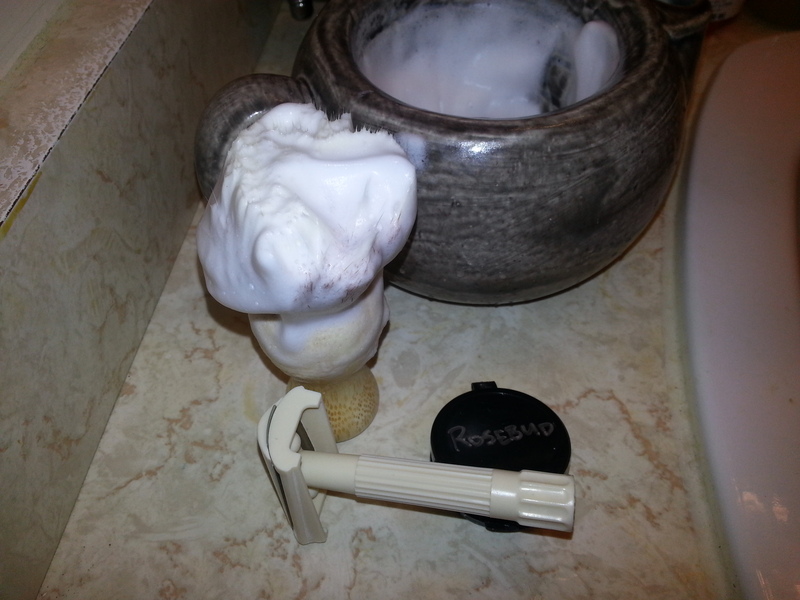 It provided quite a good shave, with loads of cushion and glide. You will want to re-whip up the lather between passes, and don’t be shy with the water either. Overall, I would highly recommend giving this one a try. 9/10. Cost: A 4 oz tub goes for 20 dollars, or you can try this scent in the $20 7 day sampler pack, with each 1/4 oz sample giving me enough for a bit more than 2 days worth of 3 pass shaves. Edit: See comments section below. If I had done things right, the sample likely would have given a good 5+ shaves worth.